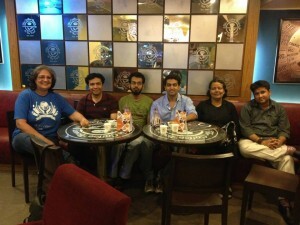 Nita, Pritesh, Ankit, Hraday, Javed and I met at the Coffee Bean & Tea Leaf, Bandra. We introduced ourselves and started talking about what started us on the path towards atheism. We found there was a comfort level in sharing our personal stories with each other, rather unlike it would be with other people we meet for the first time and interact with. Pritesh said both he and his wife, as atheists and to-be parents had been pondering over whether it would be difficult to raise their child with the right values. Nita reassured him that it was easy and one needed to just equip them with critical thinking skills. I mentioned the Nirmukta Parenting facebook group where he could find resources and share helpful real life experiences with other parents. We remembered how Moral Science was taught as a subject at school and had a good laugh wondering why it was called a “science”. While talking about Hinduism, Nita mentioned that her daughter Ayesha had discovered during her research for a paper, the little known historical facts about how the Bhagvad Gita had been extracted from the epic Mahabharat with the motive of creating a holy book for the Hindus on lines of the Bible, during the colonial era. It is always refreshing to discuss current affairs with freethinkers. Ankit talked about how the political discourse about secularism and political parties was getting rabid. Javed then mentioned that there’s no agreement on the definition of secularism in India. Speaking of definitions, he said he’s been told that he was calling himself a freethinker because he didn’t want to admit that he was an atheist. We went on to talk about how we prefer to identify ourselves and the reasons for that. Pritesh spoke about the ISRO chief’s superstitious rituals and self anointed godmen like Asaram. I expressed my concern that people still continue to flock to other gurus believing that they’re the real thing. Nita and Pritesh wondered if people in India were turning more religious instead of less. I mentioned Meera Nanda’s book – The God Market – which said that unlike other countries, in India, modernization and globalization has not lead to decline of religion. 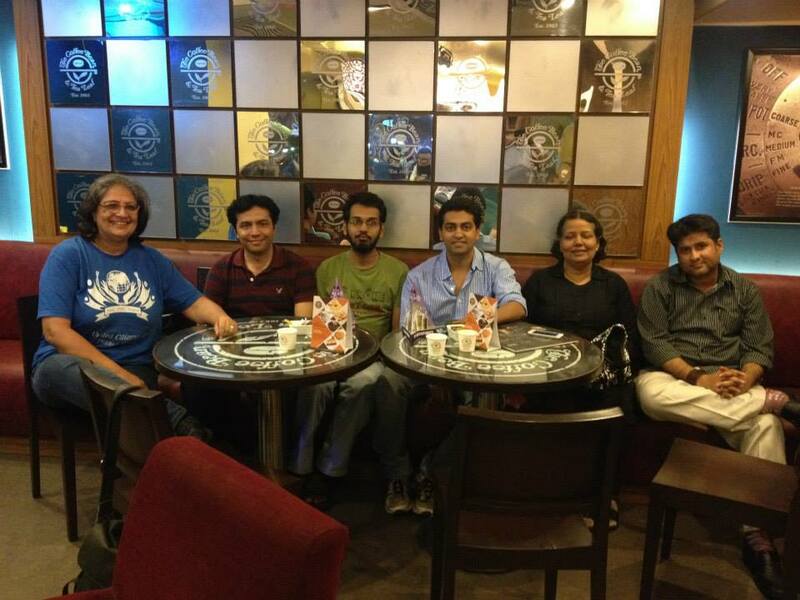 We talked about our plan of action for the Mumbai freethinkers’ group and decided to have regular meet ups and discussed what sort of events and activities we could plan. Hraday surprised us by mentioning that he’d come from Surat, Gujarat State, to Mumbai for the freethinkers’ meet. He was very eager to meet atheists as there were no such meet up groups in the region where he lived. I told him that he was most welcome to attend the MFT meets and in future he could start a local Surat freethinkers’ group. Ankit suggested that we could organize debates in college campuses with students’ debating groups and gradually promote freethought by initially starting with subjects like the state of the economy in India. Javed said that he wanted to share how he found inconsistencies while contextualizing the Hadiths and the Quran while reading various authenticated English translations. He expressed interest in debating with theists and debunking religion with scriptural quotes. Pritesh came up with a good suggestion that instead of a free flowing discussion, we should decide on the agenda for the next meet and hold a structured discussion with 15 minutes for each speaker. Nita with her experience of hosting meets raised the issue of how expensive it was to hire a place for our events in a city like Mumbai. We concluded that our in our next meet, we’ll invite Ayesha Bulani Thomas to talk about her paper on the Bhagvad Gita. MFT will screen an award winning feature film in January 2014 and invite the atheist writer/director for a talk and interactive session with members. It’s an art house film and has not had a commercial release in India, though it has been screened at freethought conventions/conferences in the USA and film festivals in Europe. This is not a true fact… Bhagavad Gita has been independent of Mahabharata for many centuries… acharyas Shankara, Madhava, and Ramanuja commented on the Gita nearly 1000 years ago… in fact, it was even a later addition to Mahabharata. As much as I oppose the Bhagavad Gita and condemn it for the historical harm it has caused to India, I have to agree with Venkat that the Gita is not a colonial era creation. Chronologically it is estimated to have its composition started around 200 BCE and and its revisions and redactions are conjectured to have been completed around 300 CE. It is even speculated it could have continued into the middle of the Gupta era. Venkat’s other point about Gita existing independently also has some plausibility though it has its contentions too. Some historians and Buddhist sources have alleged and speculated that in the later part of its redaction probably in the late Sunga era or early Satavahana era, it was annexed to Mahabharata to enhance its legitimacy and popularity. This so called information gleaned for a research paper seems more like Christian propaganda than an exercise in historical verification. Skeptics have to be watchful for these landmines of ancient Indian History. We have not discussed when the Gita was composed historically, nor have I written that in the report. If there are verifiable references about when the Gita was annexed to the Mahabharata, please share it here. I note your point and agree that this was not an observation made by you specifically. But your attribution to a reference to the Gita’s composition in the article was caught on by one of the commentors, to which I provided a response. My parting note was meant as a friendly advice to be more circumspect about representing opposing views on Indian scriptures especially with respect to its origins, authorship and chronology. This is a raw nerve of Hindu religious sensibility. The opponents can easily pounce on this and paint the critics as unscholarly. Any truth to this claim? That claim does not sound to be convincing. It seems like Western Indologists initially took fancy to the Vedas and the Upanishads and starting translating into the German, Austrian and English. It was only natural that this would lead them to Gita, since it is most commented of all ancient and medieval Indian scriptures with Bhaasyas on it by the 4 main Indian acharyas (Sankara, Ramanuja, Madhava & one Vasihnava saint). Dyaneshwari in Marathi is also a version of the Gita. All these personages existed long before the British. The unfortunate popularity of this work and its didactic similarity to Bible, perhaps caught the fancy of British that they financed the translation of these works. So there was some sort of revival of Gita during British era. But the fact remains that Gita had caught popular religious imagination long before the British colonized us. If we are to believe Premnath Bazaz (Role of Bhagavad Gita in Indian History) and VR Narla (Truth of the Gita), Gita’s revival was mainly pioneered by the Vedanta demagogue, Adi Sankara after it has fallen into decay by the end of the Gupta era. I also saw a similar post in a thread in nirmukta.net that blames the British for propping up other religious texts. If this is true did these ancient Hindu texts play any role at all in the Indian society before the British came. I have to disagree with this thesis. which does seem to point to considerable influence wielded by the Sastras in medieval India. There are references to Adi Sankara citing Manava Dharamastras in support of his doctrines or dismissing opposing doctrines especially those of Buddhists and Charvakas. References to DharmaSastras by the Arthashastra, which is also deemed to an influential work would seem to lend support to the view that the writ of Dharmasastras was running in Medieval India. Consulting Alberuni’s Indica would be another source that can serve to refute this thesis that Sastras and Sutras somehow gained sudden prominence during British India. I do not know this Brian Hatcher either, but I have read and enjoyed Patrick Olivelle’s translations of and introductions to the Dharmasutras, Upanishads, and Manu Dharmasastra. The examples you cite do not diminish the theses of these two scholars. Adi Sankara was a Brahmin pandit, so it is expected that he would know about Manu. With regard to the Arthasastra, it is itself a part of the Dharmasastra literature and is discussed in PV Kane. Within circles of legal pundits, there is no doubt that dharmasastra was well known. It is actually very well documented how Dharmasastra became the law of the land under William Jones. Who go up against a scholar like Olivelle?